Luxury retreat in the historical area of Normandy. No:16 is a luxury individual property built in 1987 on the site of a Cidre orchard, combining traditional and modern French styles. Built on a hill and set in just under 2 acres of beautiful gardens with a tree lined avenue and swimming pool. 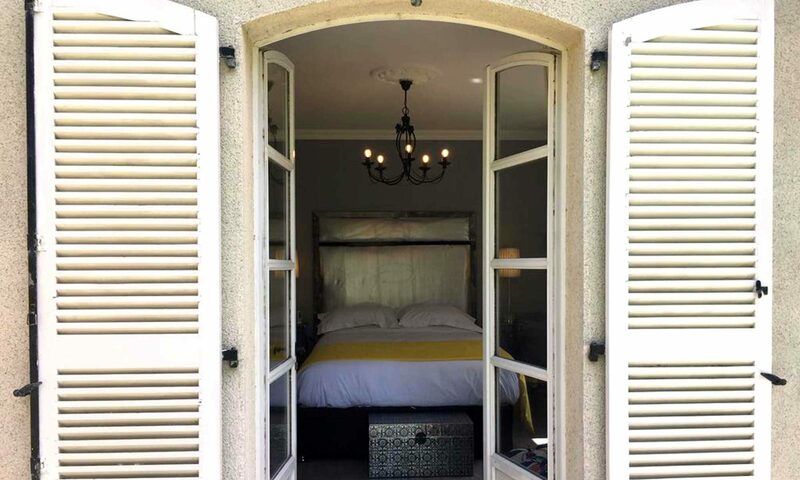 (Pool towels provided) The current owners have renovated the 5 en suite bedrooms to offer elegance and charm. 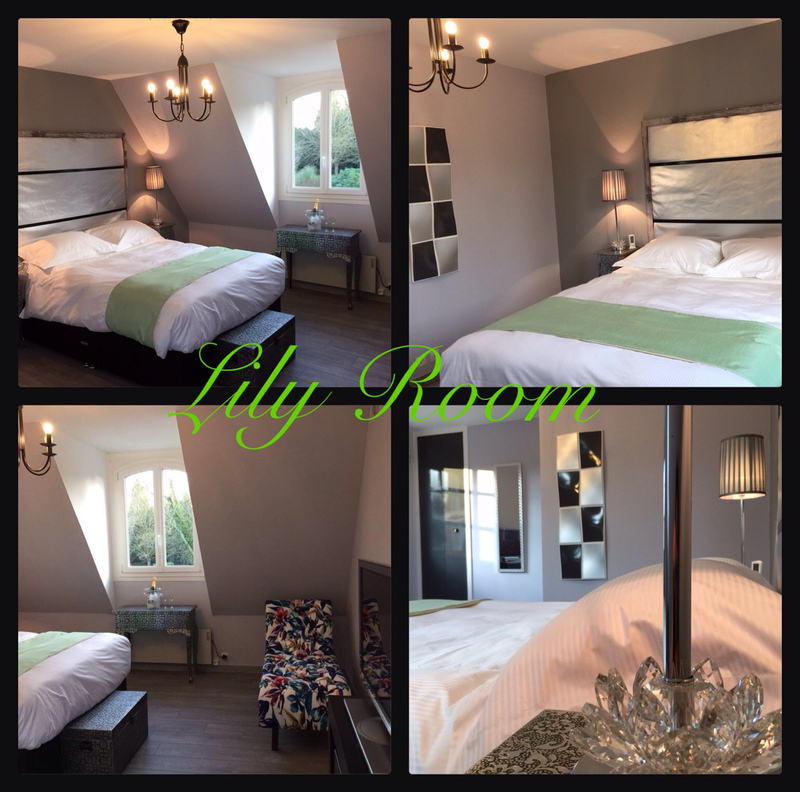 This beautiful house offers adults a luxury retreat for relaxation to enjoy the garden and pool or to visit the surrounding historical area of Normandy. Every room is complimented with 600TC Egyptian cotton bedding, dressed with silk from the Philippines. Bath robes and soft towels are provided along with complimentary toiletries, Tea & Coffee facilities and a hair dryer in each room. A Welcome bottle of complimentary Bubbly will await you in your room on arrival. Our Queens Breakfast is served in the Dining Room from 8.30am - 10am and is included in the price of your stay. Check out our Secrets Cupboard every afternoon around 4pm to see what complimentary treats are in store. Table D'Hote dinner in the Lantern Room restaurant or a BBQ in the Mediterranean Garden, is available (pre bookable at reception). Every evening from 7pm - 9pm. (Please see sample menu). CCTV for your security is in operation at this property and a large on site car park is free of charge. Tessy Sur Vire is ideally situated in the centre of all of the major attractions. A short distance from Mont St Michel, Utah Beach, D Day Museums and Aromanches, where you will find the new 360° circular cinema and museums. There are excellent cycle routes along the Vire (river). To commemorate the Tour de France in Tessy 2016, the local students have created a giant bicycle sculpture in the river Tessy! A must to view as it appears the bike has fallen off of the bridge! The area also boasts some great river and lake fishing nearby. Available for rent are Electric bicycles and push bikes - pre book is highly recommended. Week end farmer's markets in several local towns and the famous French 'Troc's' are an absolute must for anyone seeking a bargain! Saint Lo is a large town approximately 15km away. Friday and Saturday mornings are the market days. The town itself has many shops and 'eateries' and of course the patisseries are wonderful! All of our rooms are named after a particular area in the garden which is viewable from the bedroom windows. For example the Rose Room overlooks the Rose beds, Lavender overlooks the Lavender beds etc. There will be a BBQ available if the Lantern Room Restaurant is closed. Guests may enjoy a late night drink or coffee after dinner around the fire pit at the Mediterranean garden. The swimming pool is open from 10am until 9pm, it is Law in France that all pools are covered at night and this pool is covered and locked for your security. The current owners, Randy & Katie Gomez moved to France in December 2016 and have worked continually for 4 months to beautify the house. Randy was a Manager at a large hotel in the New Forest and his experience of running hotels will prove to be invaluable. Katie is from a Civil Engineering/Safety Consultant background. She still consults for several regular clients on occasions when she is not painting walls or in the garden. Previously from East Dorset where she had lived for approximately 20 years. They both decided it was about time they saw a bit more of each other as the hotel industry is very anti social, but it is the job that Randy is most passionate about. Knowing that they would not be able to afford such a grand property at home, they looked further afield to France and they are very happy in their new home. 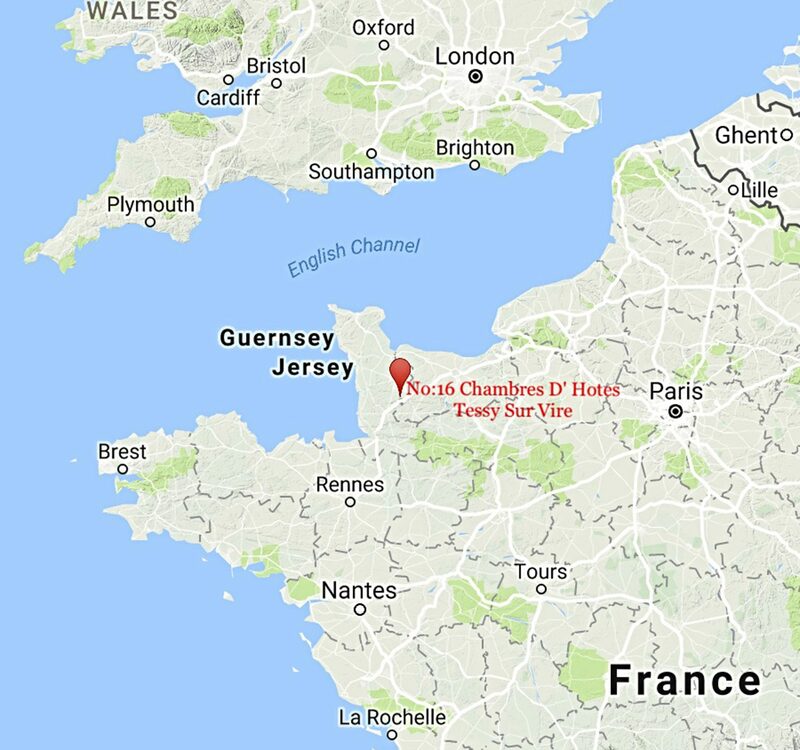 From Poole, the ferry to Cherbourg is only 4 hours or 2.5hrs on the fast cat ferry in the summer, and from Portsmouth to Cherbourg or Caen it is around 3 hours. Once in France from either port the drive to Tessy Sur Vire on relatively empty roads is just one hour to the lovely No:16 on the hill. If taking the ferry from Newhaven to Dieppe, or Dover to Calais via the Channel Tunnel, you will encounter toll roads which can make the journey from Calais 4hrs and Dieppe 2hrs. Always look on Ferry websites for offers or the local paper for vouchers and offers. We are happy to take groups, subject to availability. The costs of the rooms are 'per room' and price is based on twin occupancy, and includes breakfast. Dinner is from 30 Euro per head. 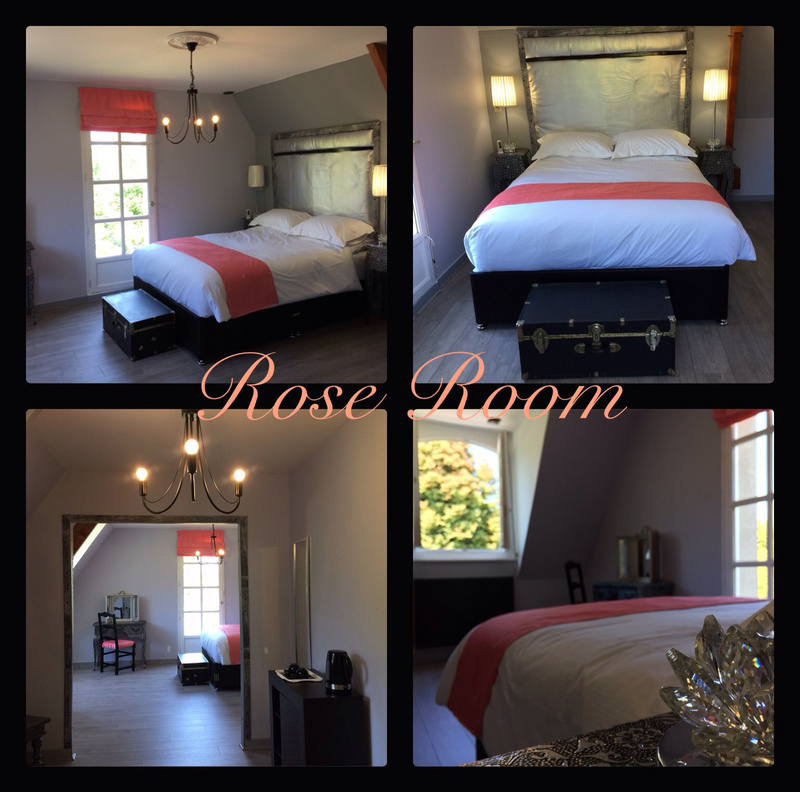 The Rose room is a large en suite room with King size bed and a lounge area. This room has a sofa bed which can accommodate a third person, the additional cost for an extra person is 50 euro per night. The Lavender is a very large room with a sofa and seating area. The en suite is a beautiful traditional marble area with a spa bath and separate shower. This room has a Super King bed which may also be split to 2 single beds. 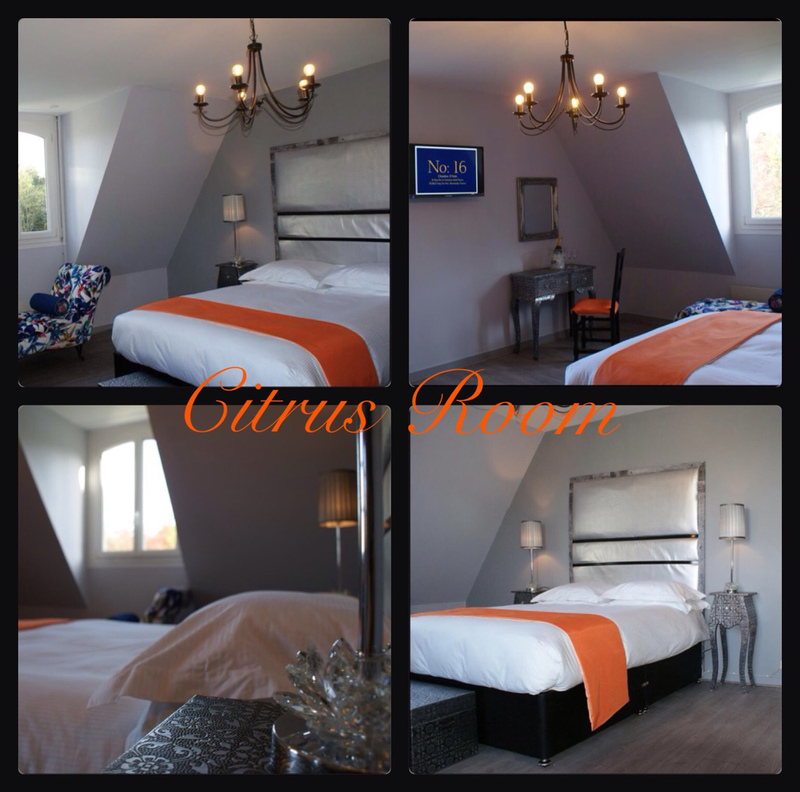 The Citrus and Lily rooms are both King size beds with en suite facilities, and both have a Chaise Lounge to relax on! On the ground floor is the Mimosa Room which is designed for those who perhaps find the beautiful marble stairs a little difficult. It has doors opening onto it's own terrace area. 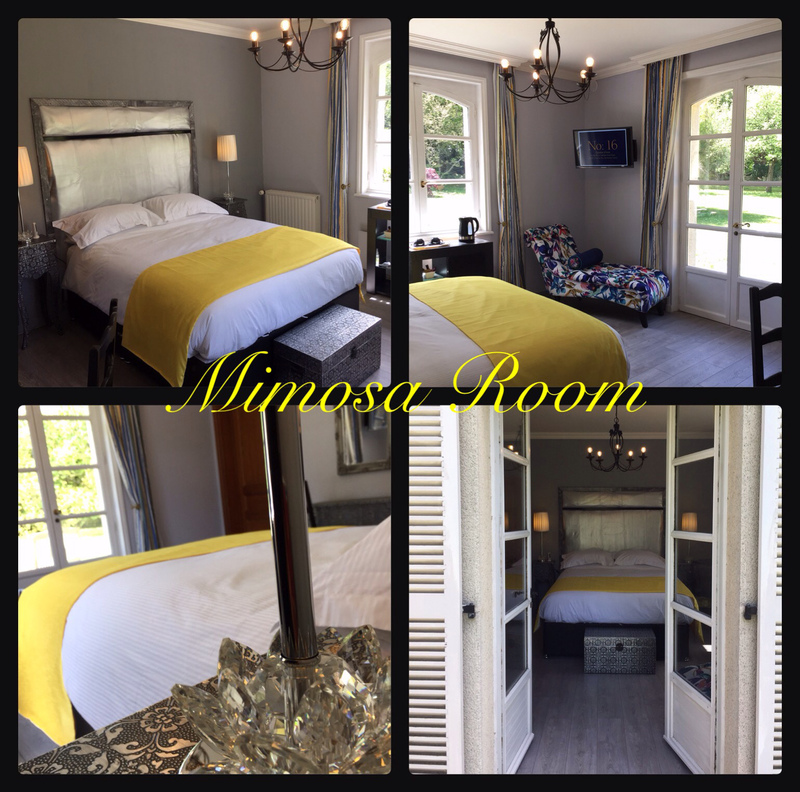 This room has a king size bed, and a chaise lounge to relax, a beautiful en suite with integral dressing room. Every guest is treated as someone special and we want you to enjoy your visit to No:16. Why did we call it No:16 ?? Because we live at 16 Rue de la Fontaine Saint Pierre, and we couldn't think of anything else!! The end of the Road!! Please fill out the form below to check availibility. Outdoor Heated Swimming Pool Now Open .. 🏊🏽 ..